With its faithful rendering of a true inspirational story, Rudy earns its sentiment...an irresistable inspirational movie for all ages. 112 min. Columbia Pictures. Directors: Angelo Pizzo, David Anspaugh. Cast: Sean Astin, Jon Favreau, Ned Beatty, Greta Lind, Scott Benjaminson. Arguably the sports movie to end all sports movies, Rudy would be laughable in its perfection of the "underdog rising to glory" tale if it weren't true in nearly every important detail. As crafted by the screenwriter (Angelo Pizzo) and director (David Anspaugh) of the equally revered basketball movie Hoosiers—also set in Indiana—the PG-rated Rudy is an irresistable inspirational movie for all ages. Daniel E. "Rudy" Ruettiger is, for all intents and purposes, the runt of a fourteen-child litter. Though little is expected of him (or anyone from his family of steel-mill workers), Rudy decides as a boy (Luke Massery) that he will grow up to play football for his father's beloved Fighting Irish at the University of Notre Dame. Older but not much larger, the grown Rudy (Sean Astin) hasn't given up on his dream. Not even the priests at the high school give the teen any moral support, and lacking the grades that would get him into Notre Dame, Rudy begins to accept that his future holds only a job at the steel mill and getting hitched to his downbeat local sweetheart Sherry (Lili Taylor). Everything changes when a tragedy close to home reminds Rudy that life is to be lived to the fullest (this seeming contrivance, like just about every plot beat in the film, corresponds to fact). It's a long road to Notre Dame—past undiagnosed dyslexia, with the help of friend and tutor D-Bob (Jon Favreau)—and an even longer road to arrive at the lowest rungs of the Fighting Irish, but Rudy's can-do attitude, hard-work ethic, and personal faith propel him to his own "Do you believe in miracles?" moment. The final destination is of little significance in sports history, or even the history of Notre Dame football, but as an example of personal triumph over the odds, it's exceptional, and only a heart of stone could withstand the emotional tsunami that accompanies Anspaugh's dramatization. 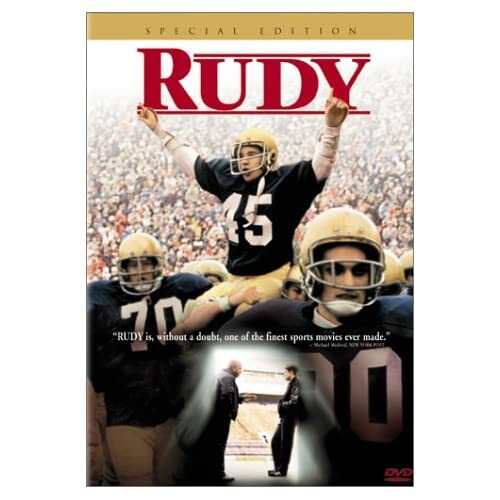 The first film since Knute Rockne, All-American to win permission to shoot on the Notre Dame campus, Rudy is peppered, appropriately, with "Gipper" references. Rudy's personal MVPs include doubting father Daniel (Ned Beatty), open-minded coach Ara Parseghian (Jason Miller) and African-American groundskeeper Fortune (Charles S. Dutton), another unlikely character who, though embellished, has a real-life counterpart (worth noting: N.D. coach Dan Devine basically gets the shaft for the sake of dramatic tension). Anspaugh has a great conspirator in composer Jerry Goldsmith, whose subtle melodic theme gradually gathers wind beneath its wings. With its faithful rendering of a true inspirational story, Rudy earns its sentiment. Sony sends Rudy onto the Blu-ray field with a hearty image that easily tackles its DVD predecessors. Though the print isn't entirely free of dirt, the fifteen-year-old film looks good, and the resulting high-definition image vibrantly captures Anspaugh's color scheme and the fine detail of the film source in the textures of the faces, locations, and costumes. The Dolby TrueHD 5.1 surround track serves the film well, leaping to life when it counts the most: for Jerry Goldsmith's soaring score and to support the football sequences. 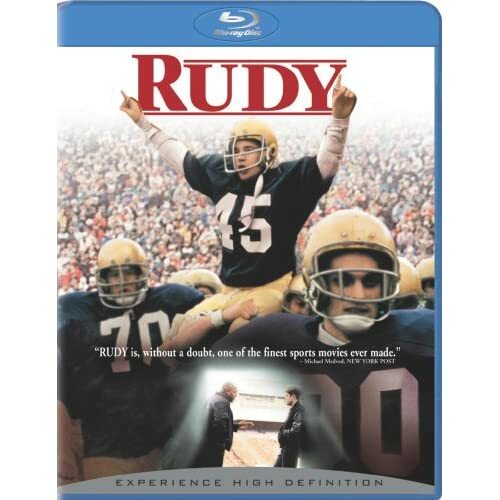 All of the DVD bonus features from 2000 have been ported over to Blu-ray, beginning with "Rudy: The True Story" (12:53), an interview with the real-life "Rudy" Ruettiger. Obviously, that's an essential supplement, which easily outshines the promotional leftovers. "Production Featurette" (3:10) is a depthless EPK with comments by director David Anspaugh, screenwriter Angelo Pizzo, Charles Dutton, Notre Dame associate VP Richard W. Conklin, and producers Rob Fried and Cary Woods. "60 Seconds with Sean Astin" (1:05) is exactly that, a brief collection of sound bites from the star. Unless and until the studio revisits this title with a full-blown retrospective and/or detailed doc on Reuttiger, the Rudy Blu-ray is hands down the best way to experience this beloved title on your home screen. All site content © 2000-2019 Peter Canavese. Page generated at 04/18/2019 01:32:59PM.